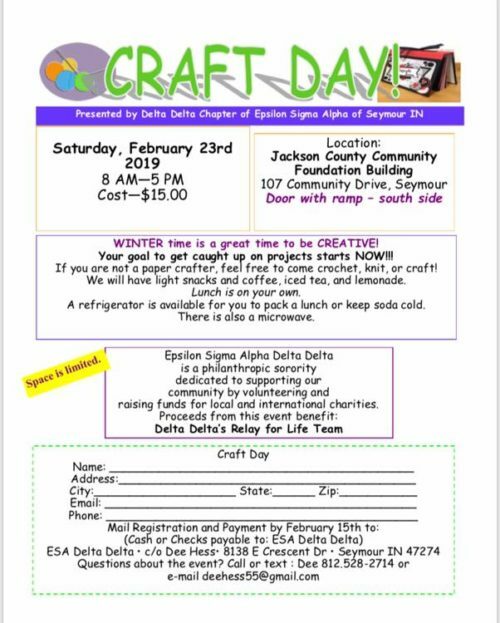 Join Delta Delta for a Craft Day benefiting Delta Delta’s Relay for Life team! For $15, join Delta Delta at the Jackson County Community Foundation Building and bring whatever crafts you would like to work on. Light snacks, coffee, iced tea, and lemonade will be provided. Lunch is on your own, but a fridge to keep a lunch cold and a microwave is also available. Space is limited, so reserve your spot before February 15! Contact Dee Hess at 812-528-2714 or at deehess55@gmail.com.